People with dull, lack-lustre skin. A stimulating face massage is easy to incorporate into your daily skincare routine. And when done right (and regularly!) the results can be plentiful: improved skin tone, better muscle contouring and a glowing complexion. Here, technology is your best friend. Wet your face and apply a pea sized amount of cleansing gel to each side of the face. Spread into a thin layer over the skin. Using your cleansing device, massage the brush head in circular motions around your face, stimulating blood flow to these areas. Spend approximately 20 seconds on the forehead and the remaining 40 seconds on the rest of the face (chin, cheeks, nose etc.). It only takes a minute and has been clinically proven to give users more radiant skin in only a few weeks! People with puffiness or facial bloating. Your lymph nodes are – put simply – responsible for fighting infection and filtering out harmful substances to keep you in good health. You have hundreds in your body, including behind your ears, under your jaw and between your nose and cheek. The practice of lymph drainage massage on your face – when done right – can help you stimulate the movement of fluid, to release facial bloating, for more toned and radiant looking skin. 1. Begin under your jaw bone, applying a light pressure to the tubes that run on either side of your neck. 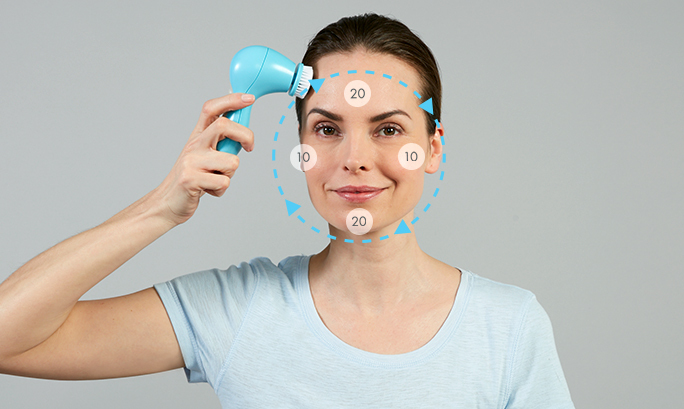 Unlike stimulating facial massage, you direct pressure downwards to drain, not upwards to tone. 2. Use a downward motion to run your fingers down either side of your nose and along the front and back of your ears. 3. Use your ring fingers to trace a C-shape around your orbital bone, patting from the inner corner or your eyebrow all the way around. This will help de-puff swollen eyes. When we stare at a computer all day, or squint regularly, our eye muscles tighten and tire. This can lead to fine lines forming at the outer-corners of our eyes. 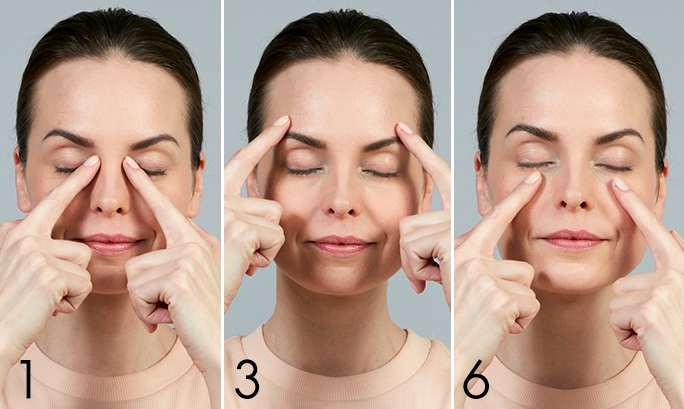 Acupressure (an ancient Chinese healing method) involves applying pressure to relieve strain, and in this case, relaxing the eye muscles to prevent wrinkle formation.